Always a pity than you don’t know the name of the person giving you their opinion, especially one outlining a potential threat to national security which implicates British citizens. As for the story, the Star says it’s in a “secret report by the Home Office”. An earlier and fuller version of this story appeared in the Mail two days previously. 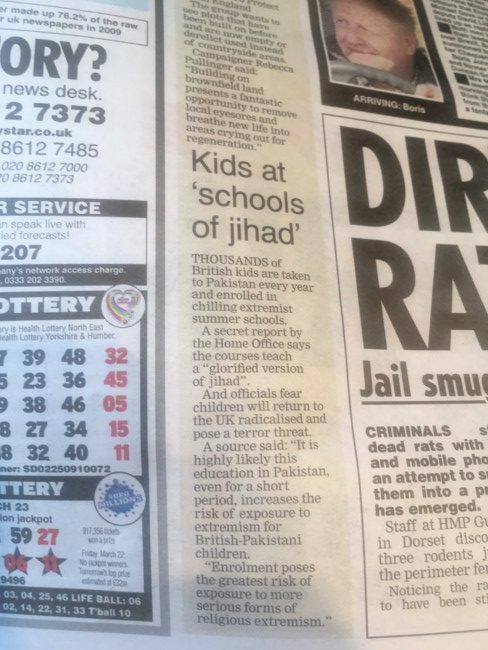 “Terrorism fears as 3,000 UK children a year go to ‘jihadi’ schools in Pakistan, secret government report reveals,” says the Mail. The inverted commas should alert circumspect readers to the fact that these schools are not jihadi schools. Like the Star, the Mail says the news is “chilling” and “secret”. That voice is again heard telling us: “It is highly likely that this education in Pakistan, even for short periods of time, increases the risk of exposure to extremism for British-Pakistani children,’ the source told The Mail on Sunday.” The teaching takes place in “Pakistan’s estimated 20,000 madrasas”. How many British children have even been to one of those three schools? Dunno. Having cast a pall of suspicion over all British-Pakistanis who choose to give their children more education, the Star and Mail don’t say. But we are told: “Two of the 7/7 bombers, Mohammad Sidique Khan and Shehzad Tanweer, enrolled on madrasa courses in Pakistan a year before they launched their deadly attack in 2005, which killed 52.” Khan was 30 when he committed an act of mass murder. Tanweer was 22. Neither was a child sent to a ‘jihadi’ school by the parents. Both were grown men when they went to school in Pakistan. The Sunday Times said Khan was assessed by MI5 in 2004, after his name appeared during an investigation into a plan to detonate a 600-lb truck bomb in London. Tanweer “looked up to Khan as a “father figure”. What role any madrasa played in their barbarity is moot. So about those madrases… There’s no proof they’re any threat to this country at all.